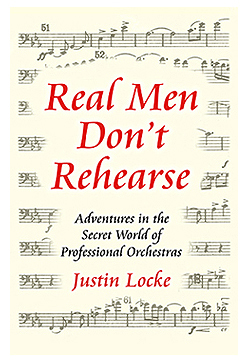 [Below you will find the Introduction and a sample chapter from my fun little Pops memoir, “Real Men Don’t Rehearse.” Now a word of caution, this is not the usual hoity-toity approach that is usually taken in the realm of classical music. I loved the glamour and adventure, but I also wanted to share the hysterical humor (as well as the grit and stress) that is so much a part of the “inner circle” of these amazing creatures who play notes for a living. It is available on amazon (also as a kindle ebook) or via any bookstore. There are many famous conductors and composers who are the stars in the world of classical music. You see their pictures on the covers of CD’s, you see them interviewed on 60 Minutes, and there are lots of books written about them. They have their roles to play, and they are important ones, but for all the hype surrounding these big names, the fact is, they aren’t really the ones who are creating the music. Whether it’s a pop ballad, a symphony by Beethoven, or the soundtrack of a major motion picture, the actual sound of an orchestra is created, note by note, not by these stars, but by individual orchestral musicians. Professional orchestral musicians live in a secret society that is seldom seen by outsiders. Even when an orchestra is in full view of an audience, their world is largely invisible. This is not an accident. Even though they are in “show business,” most orchestral musicians are rather shy and introverted people. Also, the people who market classical music assume that the audience is only interested in the stars and the glamour, so the rank-and-file orchestral musicians are expected to keep their pragmatic, sweaty, anxiety-laden lives out of view as much as possible. With so much of their work kept hidden behind a facade of straight-laced, poker-faced elegance, audiences are often completely unaware of the extraordinary inner workings of professional orchestra “culture,” and just how important those inner workings are to the making of the music. Before I became a member of this exclusive club, I had the same grand preconceptions that most people have about professional orchestras, so the reality I encountered on the stage of Boston’s Symphony Hall was a bit of a surprise, to say the least. But I always thought the reality of playing in a professional orchestra was far more interesting than the lofty fantasies produced by the press office. And so I am now going to violate the greatest taboo of the music business and tell you the real story of the often cynical, always stressful, sometimes hysterical, and occasionally magical world of the people who play notes for a living, whether it’s for an opera, a Broadway show, or the Boston Pops—at least, as it was experienced by one young bass player. I admit these stories may put a dent in some of your fondest musical fantasies. But it is my sincere hope that, by seeing into this world (however strange it may seem to you at first) you will ultimately find yourself experiencing an even greater sense of connection to your favorite music. Many people presume that for an orchestra like the Boston Pops to sound as good as it does, it must rehearse constantly for several weeks before each concert. But the Pops actually rehearses very little. There are several reasons for this. First of all, no one really wants to rehearse, as rehearsals are dull and tedious and expensive. But the real reason the Pops doesn’t rehearse all that much is because it simply isn’t necessary. In Pops rehearsals, everyone speaks in a kind of musical shorthand. Everyone already knows the “famous places” that need clarification, and these are generally handled in very short order. At most rehearsals we would just run through any pieces we hadn’t played for a while (as that was usually all we would need to do in order to see how the conductor wanted us to play a given piece), and everything would be fine. However, some days weren’t so fine. There was one rehearsal I played at Pops that was just so bizarre and strange that it’s hard to believe it actually happened, but it did. At first, it was a rehearsal very much like every other. We covered most of the program, and eventually, it was time for the guest soloist to come out. The door behind the bass section opened up, and onto the stage walked a truly lovely young lady. She was in her early 20’s, and she was very slim and extremely petite. She was introduced to the orchestra, and when we all looked at the music in our folders, there we saw . . . opera arias. Opera arias? Right away we were all silently saying, “Hmmm, well, what is this . . .? ?” Classical music is a very tradition-heavy enterprise, and usually, when you see the sheet music for an opera aria in the folder, the next thing you should see is a woman of substantial girth waddling out on the stage. She should get an “ice-cube-caught-in-her-throat” look on her face, then she should begin to warble at about 95 decibels, and all is right in the world. As it turned out, there was no fat lady. This little slip of a girl was all we had, and there was no time to fatten her up. So we ran through her two arias. This girl had a lovely sweet voice, but she didn’t have a very big voice. No surprise there. Fortunately, the arias were by Donizetti, not Wagner, so we each played with one hair of our bows and just cut way back on our volume in general and, well, it was dicey but we got through it okay. After we ran through these two arias, it was time to rehearse our guest soloist’s encore. At a Pops concert, it’s fairly typical for opera singers, after they’ve given you your minimum daily requirement of culture, to sing something from the pop/Broadway repertoire. Usually, their overly-trained voices are totally inappropriate for this lighter fare but no one, it seems, ever has the guts to tell them that, so . . . our guest had chosen Climb Ev’ry Mountain from The Sound of Music. At this point I need to mention a strange musical phenomenon that most civilians (i.e., non-musicians) don’t know about: there are some people who have perfect pitch and don’t know it. They may not have a whole lot of musical talent otherwise, but once they learn a song in a certain key, well, that’s it; they can’t sing it in any other key. I guess you can tell what’s coming. Our guest soloist had this brand of perfect pitch, and as the orchestra played the accompaniment in the key of D major, she began to sing . . . in G major. She was dead on, a consistent perfect fourth higher than the orchestra. And she did not stop. Everyone in the orchestra heard this, and of course we all immediately knew what was going on. Unfortunately, the guest conductor for this rehearsal (who shall remain nameless) did not. Now in his defense, conductors sometimes have a lot on their minds, and they are easily distracted. But this one didn’t catch on . . . for a while. He knew something was wrong, but he couldn’t quite figure out what. All the while this poor little girl was singing away, with the most wide-eyed look on her face–she knew something was wrong too but she couldn’t figure it out either. Orchestras are used to having to hold in laughter every once in a while, but this was a special case. The problem was, two out of every three notes sounded sort of okay. It was the third one that got you. What were we to do? It’s kind of rude to laugh at people when they’re singing. It’s even ruder to laugh at people when they are singing Climb Ev’ry Mountain in Symphony Hall. Have you ever been in a high school study hall with a substitute teacher when something hysterical was going on? And you knew that, even though you weren’t responsible, if you laughed out loud you’d be in the principal’s office in no time? If you have, then you have some idea of what everyone in the orchestra was going through. There was another problem though, one that was a little more serious. When a major orchestra rehearses, totally correct playing of the notes is taken for granted, so there is no mechanism in the culture, nor is there any time in the schedule, for fixing wrong notes . . . at least, not this many of them all in a bunch. And time was quickly running out. When time runs short at a Pops rehearsal, the whole operation takes on an air of urgency, as there is a great desire to get through the piece at least once so as to check for any mistakes in the printed sheet music. So we kept on playing and playing. And our soloist kept on singing and singing. Well, in spite of all the red faces, we managed to hold it in and keep on going. At least, we did until the trombones came in. Their notes were particularly loud and dissonant in relation to the singer, so the conductor decided that they were the culprits, and without stopping the music, he started to yell at them, accusing them of some kind of musical malfeasance. This was too much. The assistant concertmaster couldn’t take it anymore, so he just got up and ran off the stage. It all went downhill from there. The whole thing eventually just ground to a halt. Even with a begrudgingly granted overtime period, and despite numerous starts, stops, and extensive conferences at the podium with the principal string players, we never did get through it at the rehearsal. This young lady simply would not sing this tune in any key other than G major, but the parts were in D major, and, well, eventually time just ran out. We all spent that afternoon wondering how the management was going to get around this little conundrum. When we came out to play it in the concert that night, sure enough, the only possible solution–a hastily executed version of the arrangement written a fourth higher, in the key of G major–was in our folders. And it all went perfectly well.